Cougar fans, it’s time. Time for more blue seats and bigger video in the basketball arena. 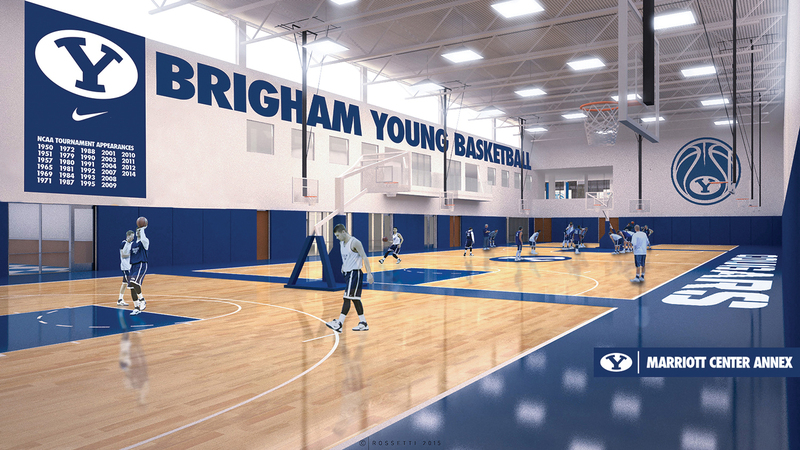 And next door will be a 38,000-square-foot annex—housing a basketball practice facility—anticipated to open by fall 2016. Many generous private donors stepped up to fund the construction and future maintenance of the annex. Have a Seat | While the Marriott Center has a long legacy, it has always been short on legroom. Jack-hammering cement in the lower bowl cleared enough space to accommodate even basketball-player legs, and the original yellow seats—now more than 40 years old—have been replaced by wider, padded blue ones. This change reduced the arena’s total capacity from 20,900 to 19,000. The rowdy student section will continue to hassle opponents shooting free throws on the west side of the arena. Court Vision | Four new LED video boards centered above the playing floor measure approximately 24 feet wide by 18 feet high—compared to the previous 12 by 9 displays. Two smaller screens underneath the scoreboard now will save the necks of those watching from the floor or lower rows. 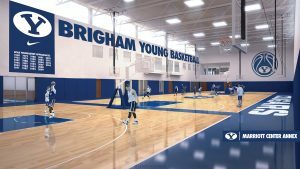 The Annex | The Marriott Center Annex will feature a full-size replica of the Marriott Center floor with shooting areas on both ends of the court. 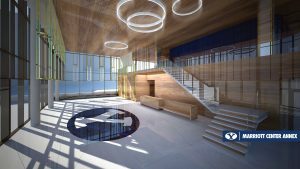 The building will also include a strength and conditioning center, a training room, men’s and women’s basketball offices and meeting rooms, study areas, and a hall of honor showcasing the history and tradition of BYU basketball. The Marriott Center has been home to BYU basketball since Dec. 3, 1971. Named in honor of J. Willard Marriott, the facility is currently the fifth-largest college basketball arena in the country. See the news release and more renderings.